The King of the Desert made Pick of the Week/Best Bet in the L.A. Life section of the Los Angeles Daily News! Rene Rivera in a galvanizing performance!" Handsomely directed." 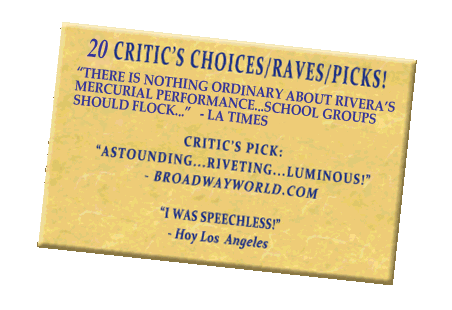 "...A post-Pirandello monologue that seldom lets up...nothing ordinary about Rivera's mercurial range...school groups should flock..."
"Riveting and profound..a superb play that could not be bettered timed." "Leaves you breathless! A compelling performance. René Rivera is Al Pacino's acting soul mate!" "Visceral and electric…grabs you by the seat of your pants and doesn't let you go." "The writing and acting are brilliant and insightful...don't miss the opportunity to see the fruits of their work." "A passionate, dramatic, oft times humorous account…an amazing performance with humor and high energy." “The King of the Desert” is one boy's search to find out who he really is in an environment that does not encourage self-expression. His journey begins in a barrio in Texas and eventually leads to The Julliard School and appearances on Broadway. "The King Of The Desert" grew out of author Stacey Martino's hunger to understand her husband's life and to learn about her daughter's Mexican American heritage. It was her own journey into the past in order to bring their family closer and alchemize the more difficult aspects of life. It grew into a wish to empower other people with similar stories across diverse communities. It is a story that weaves together her version of her husband's mythology, stories his family shared with her, and a rich cultural lineage that deserves to be explored at this time in America. It is her greatest hope that this play not only provides insights into a unique culture but reminds us how much we have in common as human beings. Copyright © CoActive Content. All Rights Reserved.